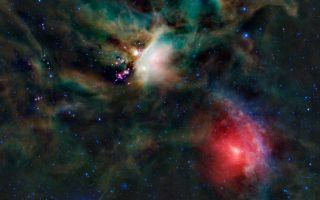 WISE, the Wide-field QInfrared Survey Explorer, took this picture of one of the closest star forming regions, a part of the Rho Ophiuchi cloud complex. It lies some 400 light-years from Earth. Dust clouds and embedded newborn stars glow at infrared wavelengths in the false-color composition. WISE, the Wide-field Infrared Survey Explorer, took this picture of one of the closest star forming regions, a part of the Rho Ophiuchi cloud complex in this cool space wallpaper.